Time sure does fly by fast! I’ve been so busy this past month, it’s like I was caught up in a whirlwind of fun and activities. We had visitors from Texas and Michigan. 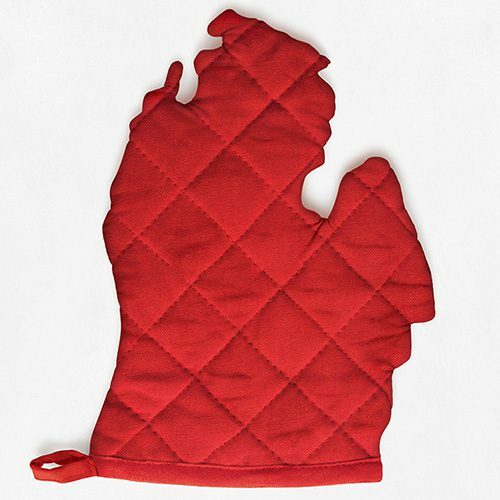 We visited Michigan over Father’s Day weekend. We got to celebrate two birthdays, one for a dear friend, Sam, and the other for our buddy Oliver who just turned one. Some culinary highlights? We went to a Cubs game on a cold drizzly afternoon, but I had a Chicago Dog complete with all the fixings (yellow mustard, onions, a dill pickle spear, bright green relish, pickled sports peppers, and a dash of celery salt on a poppy seed bun) to warm me up! That same night, we visited a neighborhood favorite, Fork. We hadn’t been there for quite some time for dinner and were pleasantly surprised by their updated menu. Our table ordered a variety of dishes to share. My favorite was a special pasta dish inspired by Dr. Suess featuring a bright pesto sauce with colorful hints of yellow bell peppers and cherry tomatoes. Another highlight was the tasty spread of food for Oliver’s first birthday party! Our friend, Will, makes the best damn grilled chicken I’ve ever eaten. His grilling skills have converted both Evan and me into dark meat eaters. His lovely wife, Sarah, whipped up a super moist and decadent birthday cake. Oliver didn’t take long to eat his first piece of cake…and neither did the rest of us! We did have one miss, and a very disappointing one at that. Evan had wanted to try David Burke’s Primehouse downtown for quite some time. The food was fine. I don’t think any of us were blown away, but it wasn’t bad by any means. It was the atmosphere that ruined the experience. It just wasn’t what one imagines when going to a high-end steakhouse. The décor was terrible and the service was mediocre at best. I guess they can’t all be winners! I mentioned our friend, Sam, earlier. 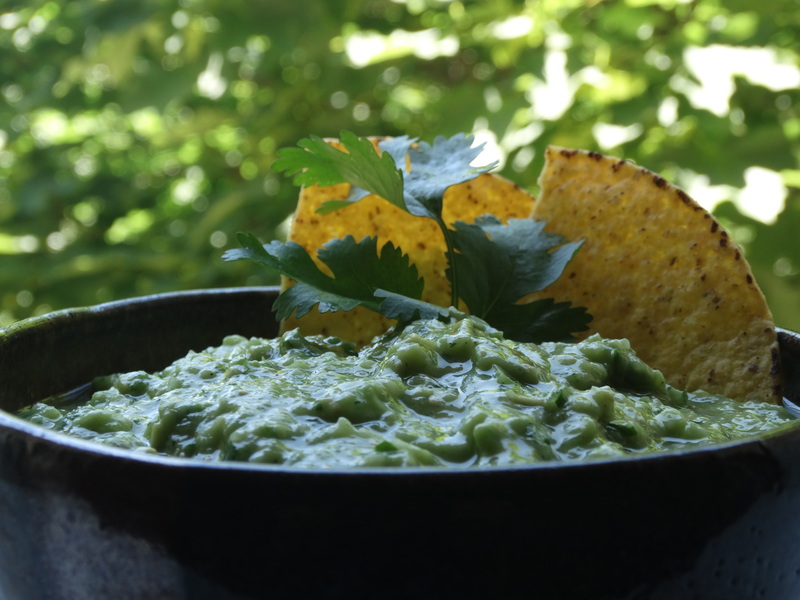 When she and her roommate threw a combined birthday party earlier this month, they decided to spice things up by asking each attendee to submit a batch of homemade guacamole for a friendly contest they’d judge. Time to bring our A games! This Tomatillo Salsamole was my entry. Sadly, I didn’t win any prizes, but I did get to try about a dozen other delicious takes on guacamole. Break out your food processor and let it do the heavy lifting for you. You will need some tomatillos, fresh cilantro, an avocado, an onion, a jalapeño, garlic, a lime, ground cumin, and a bit of salt. Begin by removing the papery husks from 8 ounces of tomatillos. Give them a good rinse with some veggie cleaner to remove the sticky residue from the skins. 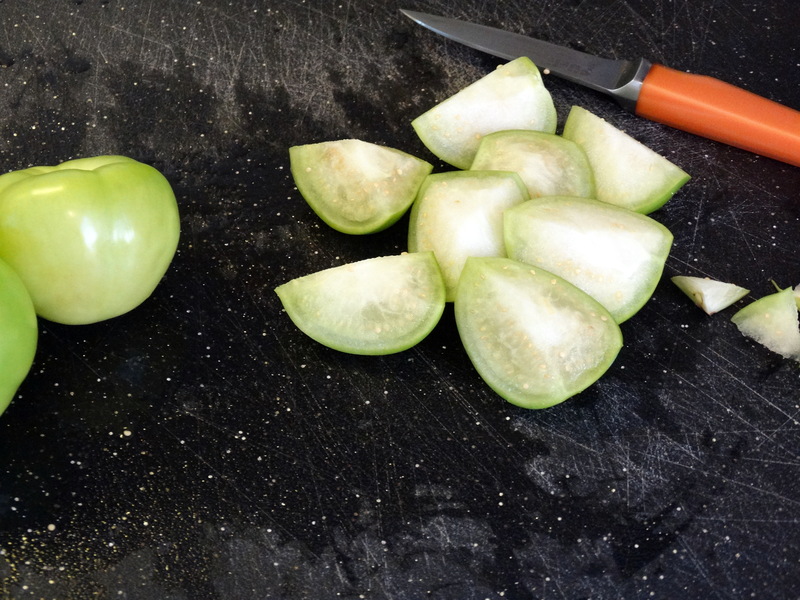 Cut each tomatillo into quarters, removing the stem nub. 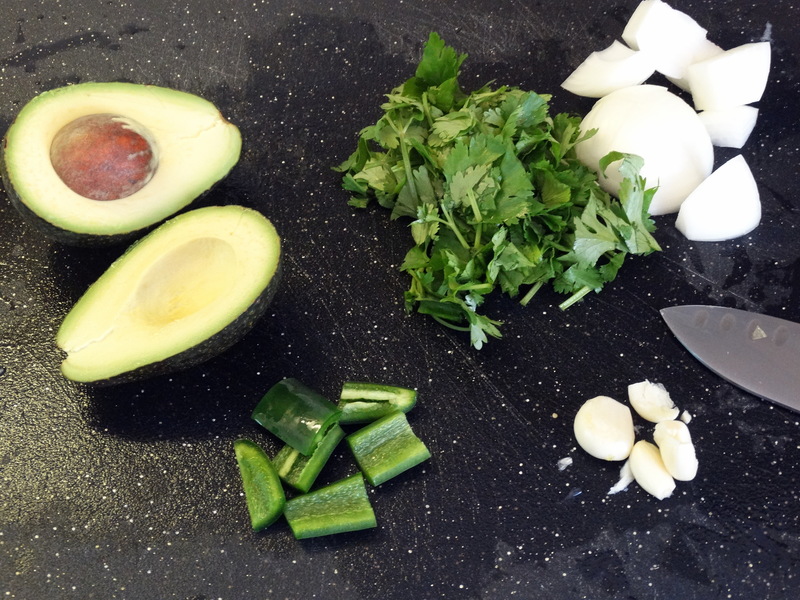 Rinse an avocado, then cut it in half and remove the pit. Wash one jalapeño pepper, remove the ribs and seeds, and chop half of it into chunks. Coarsely chop half of an onion. Peel and crush two garlic cloves. Rinse and coarsely chop 3/4 cup fresh cilantro. Juice one lime. 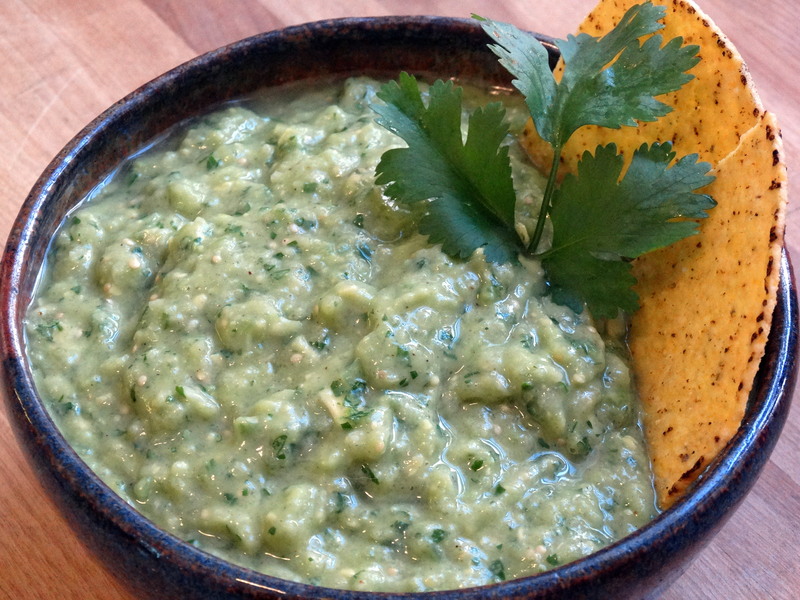 Add the tomatillos, jalapeño*, cilantro, onion, garlic, and lime juice to your food processor. Use a spoon to scoop out the avocado flesh and add it as well. Last, add 1 teaspoon cumin and a dash or two of coarse salt. Process until smooth, serve with your favorite tortilla chips, and enjoy! *If you prefer a spicier salsamole, use the whole jalapeño. Want even more heat? Save the seeds and add those too! 1) Remove the papery husks from 8 ounces of tomatillos. Give them a good rinse with some veggie cleaner to remove the sticky residue from the skins. Cut each tomatillo into quarters, removing the stem nub. Rinse an avocado, then cut it in half and remove the pit. Wash one jalapeño pepper, remove the ribs and seeds, and chop half of it into chunks. Coarsely chop half of an onion. Peel and crush two garlic cloves. Rinse and coarsely chop 3/4 cup fresh cilantro. Juice one lime. 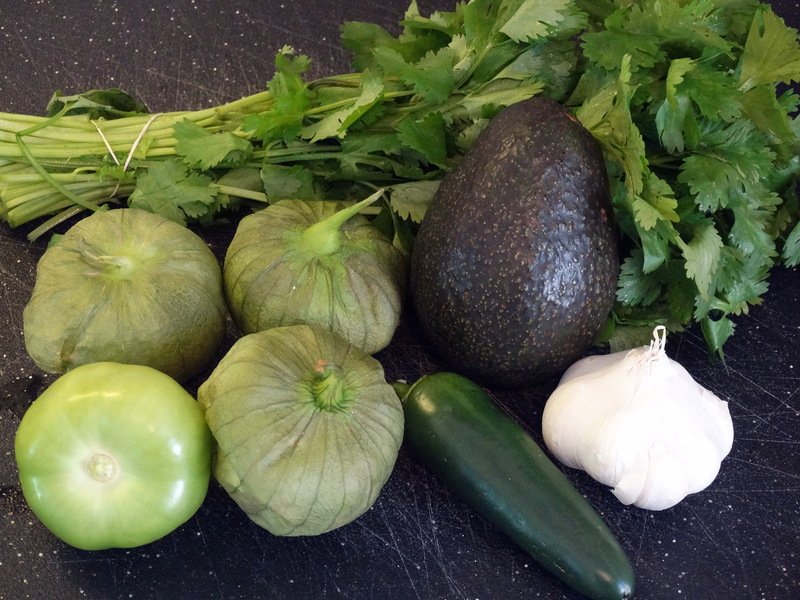 2) Add the tomatillos, jalapeño, cilantro, onion, garlic, and lime juice to your food processor. Use a spoon to scoop out the avocado flesh and add it as well. Last, add 1 teaspoon cumin and a dash or two of coarse salt. Process until smooth, serve with your favorite tortilla chips, and enjoy! *Adapted from Food Network Magazine. I am definitely pinning this gem! What a fantastic idea. Excuse me, I must go clean up the drool off of my desk now.